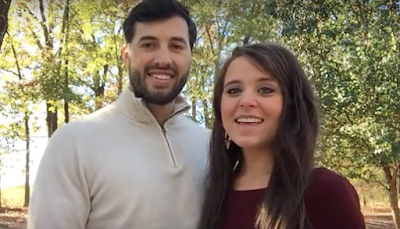 We interrupt this blogging break to bring you a video message from newlyweds Jinger and Jeremy Vuolo. Following their wedding, the two lovebirds spent a couple days in the United States before heading Down Under for a fabulous honeymoon in New Zealand and Australia. Congrats! You make a beautiful couple. so happy for the newlyweds. Enjoy your honeymoon (NZ and Australia!!! Awesome. Wishing you a lifetime of happiness and love. Great couple. You seem to be posting regularly. Why do you call it a "blogging break"? Ellie has it automatically set to post things so who can read stuft on the duggars. You can have topics appear automatically if you have them scheduled to appear on a certain date. Ellie has it automatically set to post stuff why she is taking a break. Anon 11:23 - right, I get that. IMO it's contradictory to post every day in your blog that you are taking a break from the blog. What is wrong with the back of her hair? I thought she was a perfectionist when it came to her hair? She almost made everyone late for a plane one time because she didn't have the right size curling iron, yet she has something strange going on with her hair in the video? She's a newly wed. Honestly what do you think whats wrong with her hair. ;-). Don't be jealous. Leave Jinger alone. I think it's residual curls from her up do...she needs to really wash it to get the hair spray and anything else out. I couldn't help but notice that too. It's caught up in loops? I can't figure that out. Not everyone has perfect hair all of the time. She's probably been doing a lot of traveling and she's probably tired considering she's had a lot going on. No, this is more than a condition brought on by travel. Something is wrong back there. I don't even know how you can get hair into that shape! Are those hair extensions? Wow,Jinger looked absolutely stunning.Her Wedding Dress and that 13 foot veil was Gorgeous.Jinger looked like a princess this was her dream wedding that she always wanted. I have to be honest Jingers wedding out did Jill and Jessa.The bridesmaids dresses were so different they were also beautiful on all the girls. Even the Church was made for her and Jeremy. I can not say any more. It was the perfect Duggar wedding. Congratulations Jinger and Jeremy. I always feel badly for Anna. She got married when the Duggars were still pretending to be humble and thrifty. She wore a borrowed dress and had plastic 10.00 for a 1.00 flowers. They wore home made bridesmaids dresses..and her vail..yikes! Since then the weddings have become increasingly high-end with more exotic honeymoons. Anna has gotten a bad deal all around. Anna wasn't a Duggar princess daughter. The whole Anna thing is so sad. I still remember her face on her wedding day. So excited and full of hope. Duggars have said in their books that for weddings the bride's family usually pays for weddings and grooms family for engagement parties etc so that explains why Anna was married close to her family's home and why her wedding was so cheap and different. I personally liked Josh and Anna's wedding. That song Josh sung about always being there for Anna... What happened to those promises? So happy for you guys! And wow, Jinger sounds so mature, real, and happy. A complete change from before (pre-Jer). I hope Jeremy keeps on cherising you! Congrats and God bless. Some serious (for Jinger) issues going on with the back of it! Maybe she forgot her curling iron. It could be caught on her clothing or Jeremy hand is creating the old lift. They look happy and she looks like she is adjusting well being his wife, I'm happy for them. More than likely it's from all the hair spray and taking the Bobbi pins out from the up do she had from the wedding. But you'd think she'd had a shower since the wedding??? Maybe just a bad hair day or her hair fell out of a cute hair style? She's still beautiful with messy hair! That is exactly what I was wondering! It looks like she forgot to check the back of her hair prior to the video. I have the same problem if I don’t take a look before starting my day. She’s in love and on her honeymoon, probably not thinking of her hair now, and Jeremy thinks she’s beautiful no matter the back of her head! It looks like she has extensions. That's the craziest style I've ever seen any of those girls wear, extensions or not. Yeah, it's got to be an extension. I'm kind of surprised. I wonder how long she's worn them and if any of the other Duggar girls or Michelle do. They all have thick looking hair. Let's see they we're only on a flight for 26 + hour's. Even if you're on a long flight, how much time does it take to brush your hair before going on camera? Fifteen seconds? Im so very happy for you two! I have really enjoyed your courtship, and cant wait to see the wedding. Congratulations, you make a great cute couple! Congratulations to you again and enjoy the beautiful scenery of the Lord. Take a lot of photos and create memories. Wow! Thinking about keeping their fans posted while they're on their honeymoon? Taking your film crew/camera guys along on your honeymoon? That's really sad. Congratulations. Beautiful couple. Beautiful wedding. Just heard New Zealand had a 7.5 earthquake a few hours ago. Hope Jeremy and Jinger are safe. I just saw on the news that a tsunami hit New Zealand. If Jinger and jeremy are there yet I hope they are safe. I hope j and j stay safe I heard about an earthquake that happened recently in new zealand! Hope they are safe today...Huge earthquake and tsunami warning down under. Wow, Ginger's hair is really messed up for anyone who has hair, not just her. I hope they have not headed to Australia and New Zealand yet b/c there was a huge earthquake this morning. I love all the pics of the wedding, and look forward to seeing it Tues night! Congratulations Jeremy and Jinger! To God be the glory! The night after their wedding, there was an earthquake felt in Arkansas. Now they're on their honeymoon in Australia and New Zealand, and there's been a very strong quake in NZ. So please keep us informed of their next move...so we can make it a point not to be in that same place! If they're currently in New Zealand it means they could have been involved in the earthquake... Do you have any news, Ellie? BTW, I love the non traditional fashion choices for the wedding! The colour palette was so beautiful and full of personality! Congratulations! and best wishes, Jeremy and Jinger. Is Jeremy and Jinger safe? I heard there was an earthquake in New Zealand. I would REALLY like to know where abouts in Australia and New Zealand they went!!! Congratulations to Jinger & Jeremy! Wishing you many happy and blessed years. May your life together be one filled with love,health,happiness and blessings. Ellie please let us know if they are ok as soon as you can. I heard about the earthquake and thought of them being in New Zealand! Praying they're safe! I love how Jinger smiles when Jeremy's talking. :) So sweet! Wondering if they are in New Zealand yet, and if they were there during the earthquake, and if so, how they are? Do you know if they went to New Zealand first or Australia? I just heard there was a 7.8 magnitude earthquake in N.Z and I'm concerned for their safety. Perhaps if you hear anything,please,please let us know. Thanks ladies! Why is everyone criticizing Ginger's hair? If she's okay with it like that then who are we to judge?? Jinger, like the other older Duggar girls, spends an inordinate amount of time getting her hair perfect. Then to have it look like that on a video? Something is not right. She probably was not aware it was like that in the video. I agree, people don't like it when someone talks about Derick's man bun, so why is it okay to talk about and criticize Jinger's hair? Because the Duggar girls are so into their hair that they post hair tutorials on the internet, and Jinger's hair is abnormal in that photo. Looks like an extension gone awry. That's why. Ah, yes, a honeymoon "nap." Wink, wink! We used to call it "honeymoon hair." God Bless and Good Luck... May you be in his protection and love as you undertake the Great Commission. Is jingers n Jeremy ok where they effected by the earthquake??? Just worried. Were Jeremy and Jinger in new Zealand during the earthquake?? Hope they are safe. Aww, they look so happy! I hope their not in NZ right know because their was and earthquake in New Zealand last night and 2 people were killed. If they're having so much fun they shouldn't be worrying about making hype videos like this for the family business. Who works on like Day 2 of their honeymoon? Didn't they just thank everyone for their support and prayers in a video a couple days before this? The one from the wedding. Jeremy looks mighty tired in that video. I wonder if Jeremy's hiding his neck for some reason. He's zipped right up to the neck. For all those who have asked, Jinger and Jeremy are safe. They were not in New Zealand when the earthquake happened. Praying for those who were impacted! Ooh thank God! I was worried too. Thank you for the update! I met Jinger and Jeremy last night at the Sydney Opera House. They were so lovely, just as they seem on TV, and said they've been having an amazing honeymoon, and we got a lovely picture with the two of them - they were so sweet!!! Please keep us up on what you are doing. I'm going to the Internet everyday to catch up where you are. Like in Texas or with the duggars in Arkansas or with his.parents. just a little update please.